Playwright. Theater junkie. Fringe blogger (16 years and counting). Twitter would be here, and Instagram would be here. For more, visit my website. 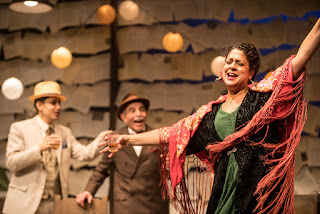 You know that question, “Is it hot in here or is it just me?” In the case of the Jungle Theater’s production of Nilo Cruz’s Pulitzer Prize-winning play Anna In The Tropics, it is both hot up on stage, and given the response of the audience, also hot for the people watching the show. People in the audience were fanning themselves, sighing, whooping, and generally exhaling in a way that indicated they were very hot and bothered, in the best possible way, by the story unfolding in front of them. When you put together Cruz’s script with the team of actors and designers recruited by director Larissa Kokernot, you can hardly blame anyone for being a little carried away. If the winter weather’s getting you down, let Anna In The Tropics heat you up a little bit. Nilo Cruz takes us back to Florida in the late 1920s, when cigars were still rolled by human hands, and to help them pass the time, the employees of the cigar factories would hire a lector, someone to read to them while they worked, helping their minds to escape the monotony of their task. Santiago (Al Clemente Saks) and his wife Ofelia (Adlyn Carreras) own one such cigar factory. They work there alongside their two daughters Conchita (Nora Montañez) - with her husband Palomo (Rich Remedios) - and Marela (Cristina Florencia Castro). Santiago’s half-brother Cheche (Dario Tangleson) also helps run the factory but is frustrated in his attempts to modernize it with machines. He wants full ownership of the place, and Santiago’s gambling may give him an opportunity to take it. The new lector they’ve brought in to read, Juan Julian (Juan Rivera Lebron), chooses Tolstoy’s classic novel of love and infidelity Anna Karenina. The women are quite taken with the story, but the Cheche and Palomo have their own personal reasons for being less enthused. Cheche’s wife ran off with another lector, and it looks like Conchita may be inclined to repeat history. Much of the play is a slow burn, and an enticing one at that. There were a couple of abrupt turns in the plot (don't worry, no spoilers) which jolted me, but given how worked up or swept away everyone in the story can get, emotions were bound to boil over in ways I couldn’t predict. The final outcome, though, is very satisfying, and the very final image quite beautiful. This beauty is an equal product of Cruz’s words, the actors’ artisty under Kokernot’s guidance, and the design of the world around them. Andrea Heilman’s set is simple but just gorgeous. The walls are made up of lines of translucent yellowed pages from a book. At key moments in the action, the pages will rotate on the wires on which they hang, and the wall opens up to the blue sky, sun and hint of clouds behind them. Barry Browning’s lighting interacts with Heilman’s set in these moments to seem almost magical. Sarah Bahr’s costumes, Paul Bigot’s wigs, and C. Andrew Mayer’s sound design all reinforce both the time period, and also these heightened moments of romance and fantasy. This production takes the sensuality of the words in the script and brings them to full life onstage in a way that easily swept the audience right along with it. Anna In The Tropics is the kind of play you enjoy surrendering to.